Few new cars have been more anticipated than the BMW 2 Series Coupe when it arrived in early 2014. 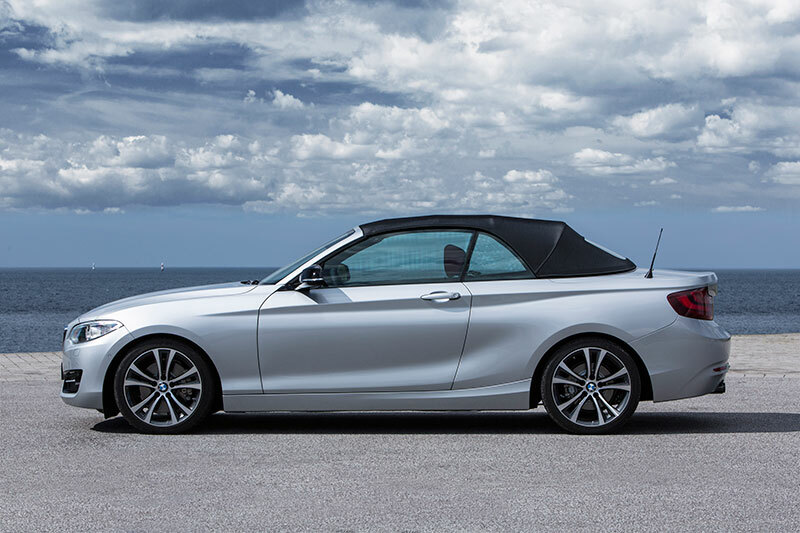 Hot on the heels of the widely acclaimed BMW 228i and M235i Coupe, BMW announces the new 2015 BMW 2 Series Convertible. Available in the US as the 228i and M235i, the 2 Series Convertible blends the style and dynamic driving character for which the 2 Series Coupe is already renowned with the open-air pleasure of a folding soft-top. The BMW 2 Series Convertible will make its world debut at the Paris Motor Show. The 2015 M235i and 228i as well as the 228i xDrive, featuring BMW’s intelligent all-wheel drive system, will arrive in US showrooms in early 2015. The 2015 BMW 2 Series Convertible will be offered at a Manufacturer’s Suggested Retail Price of $38,850 for the 228i, $40,650 for the 228i xDrive, $48,650 for the M235i, including $950 destination and handling. The BMW 2 Series Convertible follows in the tire tracks of the pioneer and undisputed leader in its class – the BMW 1 Series Convertible. The 1 Series Convertible entered the fray as the first open-top premium model in the sub-compact segment, went on to defend its position as clear market leader against subsequent pretenders to its throne, and achieved sales figures in excess of 130,000 units worldwide. The development team for the new BMW 2 Series Convertible has focused squarely on building on the strengths which proved pivotal to this success. With even more grace, athleticism and sharpness about its design, clear advances in terms of performance as well as efficiency, and improvements in the driving comfort, functionality and innovative equipment features it offers, the BMW 2 Series Convertible takes the qualities displayed by its predecessor to a new level. The number 2 has a special importance in the model history of BMW and, since the arrival of the BMW 02 range more than 45 years ago, has represented exceptionally sporting driving pleasure in a subcompact car. Introduced in 1966, the 02 series went on to become a byword around the world for sporty, agile handling – and from 1967 these gifts could also be enjoyed with the roof down. Specialist coachbuilder Baur wasted little time in developing a pair of soft-top variants based on the BMW 02 range which were produced until 1975. Elegance and openness in the established style of BMW Convertibles. The exterior design of the BMW 2 Series Convertible displays the typical characteristics of an open-top four-seater from the Bavarian brand. The BMW 2 Series Convertible combines a low-slung silhouette and dynamically stretched lines with compact proportions and powerfully contoured surfaces. As with the 2 Series Coupe, its distinctive looks underline its standalone status in the brand’s model line-up and spotlight the dynamic potential, exhilarating open-top driving experience and premium characteristics which customers can expect. All in all, the eye-catching features which distinguish the BMW 2 Series Convertible from its rivals need no second introduction. Opening the standard electrically-operated soft-top roof highlights the harmonious transition between the exterior and interior. The shoulderline and soft-top compartment create a level surface that wraps around the passenger compartment and evokes the distinctive “boat deck” character of BMW Convertibles. The rollover bars, which remain out of sight unless deployed as required, also contribute to an overall impression dominated by large level surfaces. The design of the interior is headlined by modern functionality, high-quality materials and the driver focus for which BMW is renowned. And exclusive accents in the center console help to give the BMW 2 Series Convertible a refined premium feel in keeping with the car’s character. Hallmark BMW design language, classical features of a BMW Convertible. The front end of the BMW 2 Series Convertible, which adopts the brand’s familiar design language, exudes power and presence. As with the BMW 2 Series Coupe, front-end structuring comes courtesy of lines that converge dynamically on the large, slightly forward-slanting BMW kidney grille. The contours of the twin circular headlights narrow at their inner extremes and are replicated by the outlines of the outer air intakes. Air Curtains integrated into the front apron serve to channel the onrushing air precisely behind the front fenders, reducing turbulence in the wheel arches. The headlight units are separated from the BMW kidney grille by narrow strips on either side. An LED accent strip – or, if the Xenon lights are fitted, an LED accent light – cuts across the top of the headlights. Together, the level shoulderline of the BMW 2 Series Convertible and the car’s telltale BMW proportions – the product of short overhangs, a long hood, long wheelbase and set-back passenger compartment – create an ideal environment in which to enjoy an exhilarating open-top driving experience. The positioning of the seats well back in the body gives the driver and passengers an up-close-and-personal experience of not just the onrushing wind and the sun’s rays but also the transfer of power to the rear wheels. Its shoulderline rises slightly to the rear and merges into the virtually horizontal trunk lid. And it links up with the prominent swage line running alongside it, through the door handles and into the rear, to create a dynamic wedge shape which captures the forward-surging urgency of the BMW 2 Series Convertible. Additional character lines leading from the doors and side skirts to the rear fenders divert the eye to the powerfully formed surfaces around the rear wheel arches, which duly focus attention on the car’s rear-wheel-drive set-up. The BMW 2 Series Convertible’s body is at its widest around the rear wheels. The rear lights, which extend well into the fenders, display the familiar BMW L-shape and have LED-powered light strips. The third brake light is integrated into the trunk lid and likewise illuminates using LED units. The interior: driver-focused cockpit, cutting-edge functionality, refined premium ambience. The arrangement of displays and controls familiar from other BMW models gives the BMW 2 Series Convertible’s cockpit a familiar driver focus. The surface structure of the instrument panel, center console and door trim follows the overlapping principle known as “layering”. The bespoke design of the BMW 2 Series Convertible’s center console creates a refined premium feel on board. The controls for the audio system and climate control are set against high-gloss black surfaces, and the air vents have chrome surrounds. These elements are joined by an exclusively designed display for the climate control system with white readouts on a black background. An array of stowage areas and large storage compartments in the doors, meanwhile, contribute to the modern functionality of the interior. Sport Line and M Sport provide greater individualization. 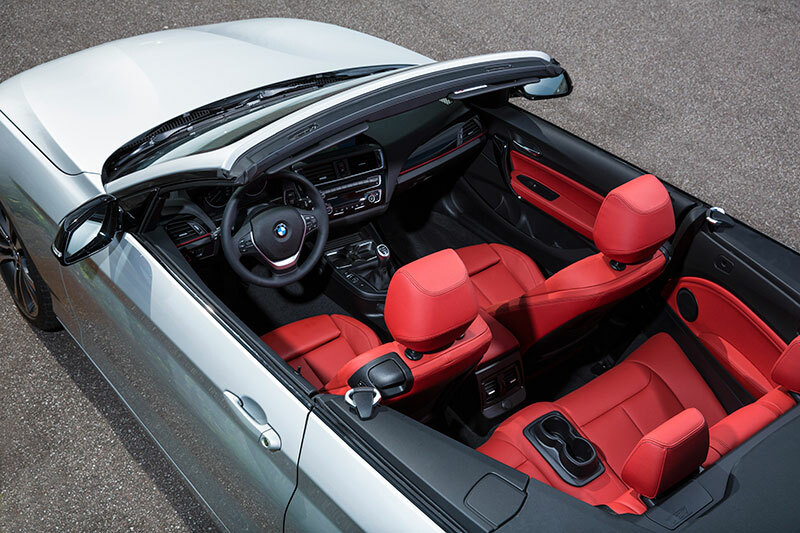 As the first open-top M Performance Automobile, the M235i Convertible has all the elements to maximize the performance potential of the 2 Series Convertible. Customers of the 228i Convertible tempted to look beyond standard specifications will be able to order one of two lines in the US each of which offer individualization through the use of tailored design and equipment features. Sport Line adds 18-inch light-alloy wheels in their own exclusive design plus sport suspension (not available with xDrive) special door sill strips, seat upholstery, interior trim strips and car key designs. M Sport also comes with its own unique trims, car key, plus an M Sport aerodynamic body kit developed specially for the BMW 2 Series Convertible. The surrounds for the outer air intakes, the front of the kidney grille bars, the cross rib in the central air intake and the rear apron all have a high-gloss black finish in the Sport Line. These details join together with a reduction in the number of kidney grille bars from 11 to 8 and exhaust tips in black chrome to highlight the dynamic character of the BMW 2 Series Convertible. Sport seats for the driver and front passenger, a specially styled instrument cluster and a knee pad on the driver’s side of the center console heighten the sense of sporting flair in the interior. M Sport, on the otherhand, also comprises sport suspension tuning, including a 10-millimeter drop in ride height (not available on xDrive). In addition, it features 18-inch M light-alloy wheels in double-spoke design, aerodynamically optimized body elements (including large front air intakes, eye-catching side skirts and a diffuser for the rear apron), as well as a special design for the BMW kidney grille and a exhaust tips in high-gloss chrome. In addition to aluminum door sill strips bearing the M logo, features such as sport seats for the driver and front passenger, Aluminum Hexagon interior trim strips with an accent strip in Estoril Blue, an M leather steering wheel, a special dial design for the instrument cluster, and an M driver’s footrest also combine to bring an aura of sporty driving to the interior of the BMW 2 Series Convertible. The Track Handling Package, which is available on the 2015 228i Coupe, will also be available for the 228i Convertible. Inspired by the original formula of BMW “S-package” vehicles manufactured in the course of the past three decades, the new Track Handling Package embraces the desires of the most enthusiastic BMW drivers. It includes the Adaptive M Suspension, Michelin Pilot Super Sport tires on unique 18-inch light-alloy wheels, Variable Sport Steering, and M Sport Brakes. The fabric soft-top opens and closes in 20 seconds, even when on the move; three color variants, optimized acoustics. 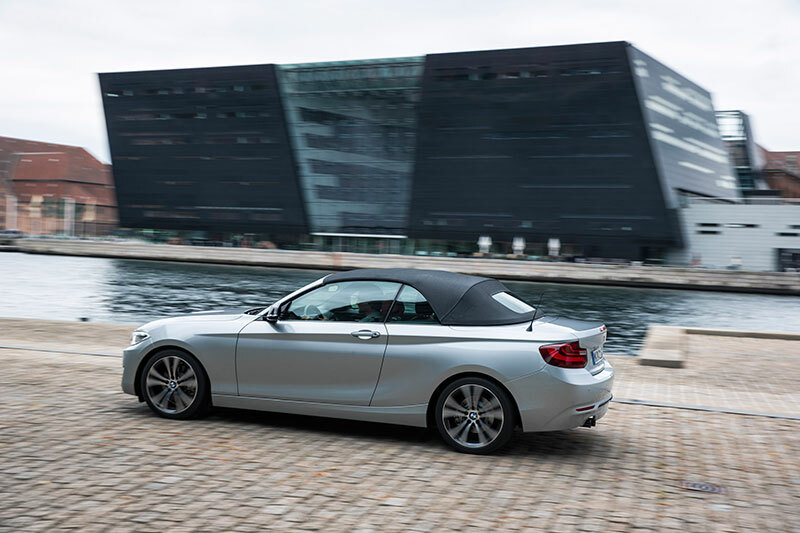 The lines of the multi-layered fabric roof emphasize the dynamic looks of the BMW 2 Series Convertible. The soft-top’s classic, pared-down appearance exudes a feeling of lightness and is complemented by optimized acoustics and unrestricted year-round usability. Soundproofing has been improved compared with the car’s predecessor through the introduction of additional insulation for the soft-top skin. This measure cuts interior noise by 5 dB(A) in the front seats and 7 dB(A) in the rear. When spontaneous open-top driving pleasure is the order of the day, the standard electrically operated soft-top can be opened in 20 seconds at the touch of a button – and it also closes in the same small sliver of time. The opening/closing process can also be initiated while on the move at speeds of up to 30 mph (50 km/h). If the car features the Comfort Access option, the roof can also be opened and closed remotely. As an alternative to the standard Black, the fabric soft-top can be ordered in two optional colors. For the Anthracite with silver effect top and Brown with silver effect option, the fabric of the cover is interwoven with fine shiny fibers. This gives the material a high-quality, shimmering metallic surface impression, producing attractive reflections under sunlight. Increased spaciousness, load capacity and variability. The increased exterior dimensions of the BMW 2 Series Convertible over its predecessor mean occupants in the four seats can enjoy extra spaciousness and freedom of movement. In addition, the access space through to the rear is now 0.4 inches larger, which, when combined with the standard Easy Entry function for the front seats, means that using the rear seats is a significantly more comfortable experience. The interior and trunk space can now be used in a wider variety of ways. SAE volumes are not yet available, however, by EC measure the trunk capacity has increased by nine percent with the roof closed and seven percent when the top is folded. The width of the opening to the load area between the rear lights has been increased by 1.4 inches. The soft-top compartment can be raised using a lever in the trunk, increasing capacity. A through-load is standard on the BMW 2 Series Convertible. The aperture between the trunk and rear compartment, available for use when the rear seat bench is folded down, has been expanded in width by 5.9 to 17.7 inches and in height by 1.1 to 9.7 inches. As a result, owners can now transport two 46-inch golf bags, for example, or a pair of snowboards. With large door pockets, a larger glove compartment, two cupholders in the center console and a storage compartment under the armrest, the BMW 2 Series Convertible also offers increased stowage capacity inside the passenger compartment. The lower section of the door trim offers space for drinks bottles up to one liter in size, while the standard storage package includes cargo nets on the backs of the front seats and securing lugs and nets in the trunk. 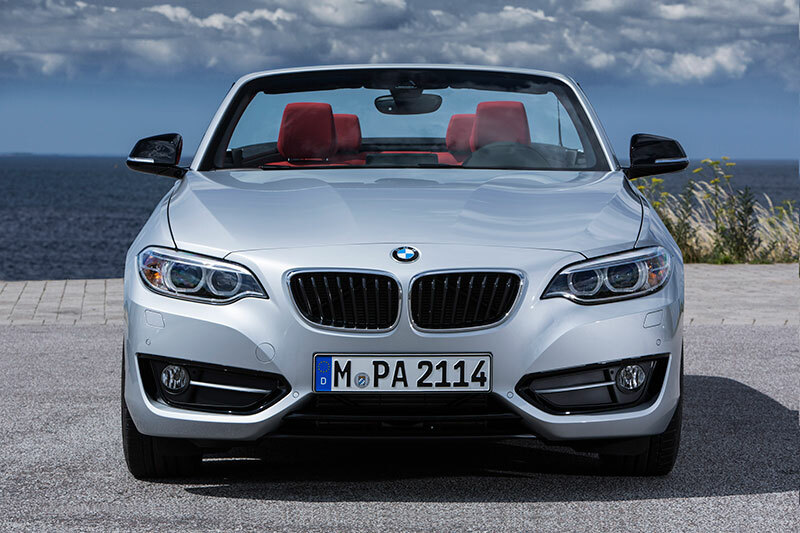 BMW 228i Convertible: Power for typical driving enjoyment with efficiency. Aided by BMW TwinPower Turbo technology with twin-scroll turbocharger, High Precision Direct Petrol Injection, VALVETRONIC fully variable valve lift regulation and Double-VANOS variable camshaft timing, the four-cylinder engine of the BMW 228i Convertible generates maximum power of 240hp between 5,000 and 6,500 rpm from a displacement of 2.0 liter. Its peak torque of 255 lb-ft can be harnessed all the way from 1,450 to 4,800 rpm for sporty power and performance. 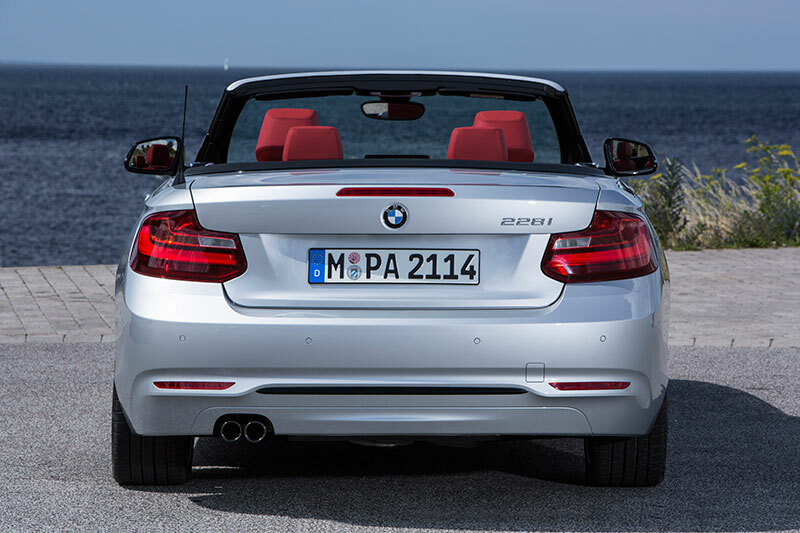 Mated to an 8-speed sport automatic transmission, the 228i Convertible will accelerate from 0-60 mph in 5.7 seconds. The quick-shifting 8-speed sport transmission includes steering wheel shift-paddles which allow the driver to intervene manually when desired, while a Launch Control function provides the best possible traction and dynamics when accelerating from standstill. This increase in performance also comes with greater efficiency. While EPA numbers are not yet available for the 228i Convertible, for sake of comparison, the 228i Coupe is more than 30 percent more efficient than its 128i Coupe predecessor. In a first for BMW in this class of premium convertible, the 228i Convertible will be available with xDrive, the company’s intelligent all-wheel drive system right from launch. The 228i xDrive sprints from 0-60 mph in just 5.6 seconds. BMW xDrive is unique in design and construction. In normal conditions, driving torque is always transmitted to the rear wheels, and most of the time to all four wheels. Normal torque split is 70% rear/ 30% front. The portion of torque transmitted to the front wheels is controlled by a multi-disc clutch that can be fully open, fully engaged or at any level of partial engagement in between. The torque split between rear and front wheels is thus steplessly variable. The clutch is directed by an electronic control system in response to actual road and driving conditions. This gives xDrive a dynamic ability that is unparalleled by other all-wheel drive systems. xDrive does more than just optimize traction; it can also enhance both agility and stability on grippy as well as slippery road surfaces. Using the same type of logic that Dynamic Stability Control employs to recognize and correct for excessive over- or understeer, xDrive adjusts the front/rear torque split to avoid these tendencies. If the system senses oversteer, it closes the multi-disc clutch completely, sending the maximum possible torque to the front wheels. In the case of excess understeer, xDrive opens the clutch completely, sending no driving torque to the front wheels. Driving Dynamics Control switch fitted as standard; ECO PRO mode with coasting function and Proactive Driving Assistant. The standard Driving Dynamics Control switch allows drivers to choose between ECO PRO, COMFORT, SPORT and SPORT+ driving modes. ECO PRO mode supports relaxed, fuel-efficient driving with features such as a coasting function. This function decouples the engine from the rest of the drivetrain when the accelerator is released at speeds between 50 and 160 km/h (approx. 30–100 mph). Vehicles with the Navigation system also include a Proactive Driving Assistant function, which tells the driver when to lift off the throttle ahead of features such as corners, turn-offs, roundabouts and speed limits. Standard-specification BMW EfficientDynamics technology includes Brake Energy Regeneration, on-demand operation of ancillary units, Electric Power Steering, Optimum Gearshift Indicator (manual transmission) and the Auto Start Stop function, which is included with either a manual or an automatic transmission. Chassis: precise tuning and wide range of optional systems for enhanced sporty performance and comfort. The driving experience in the BMW 2 Series Convertible is defined by an outstanding balance between sporty performance and comfort, courtesy of highly advanced, precision-tuned chassis technology, which includes a double-pivot front suspension with spring struts and anti-roll bars as well as a five-link rear suspension, an electrically assisted rack-and-pinion steering system and a high-performance braking system. With its low-weight components, the increase in track width and wheelbase compared with the previous model, the rear-wheel-drive set-up, the low center of gravity and the balanced load distribution between the front and rear axles, the BMW 2 Series Convertible chassis is ideally equipped to offer confident agility, precise handling and superior driving comfort. Standard Dynamic Stability Control (DSC) includes functions such as the Anti-lock Braking System (ABS), Dynamic Traction Control (DTC), Cornering Brake Control (CBC) and Dynamic Brake Control (DBC). These systems are complemented by Brake Assist, Fading Compensation, the Brake Drying function, the Start-Off Assistant and the Limited Slip Differental emulating Active Differential Brake (ADB-Sport) on the rear axle, which is active even in DSC-Off mode. The BMW 228i Convertible is equipped with standard 17-inch alloy wheels. 18-inch alloy wheels are available as optional equipment, while the accessories range includes 19-inch forged BMW M Performance alloy wheels. The available Track Handling Package includes a range of chassis systems including variable sport steering, which features a variable-ratio steering rack that becomes more direct as the steering angle increases, for example when parking or making a turn. Included in this package is the M Sport brake system featuring four-piston fixed calipers at the front, two-piston fixed calipers at the rear and extra-large brake discs. The calipers are painted dark blue and carry the M logo. The M Sport brakes require 18” light alloy wheels with Michelin Pilot Super Sport tires non-run-flat performance tires. Also included is the Adaptive M suspension with electronically controlled dampers with a 10-millimeter reduction in ride height compare to the standard suspension set-up. Following the BMW M235i Coupe, the M235i Convertible becomes the first open-top M Performance Automobile, offering the characteristic M brand of exhilarating driving enjoyment. Like the coupe, it features a higher-output M Performance TwinPower Turbo inline six, mated to either an 8-speed sport automatic or six-speed manual transmission. Aerodynamically optimized body features and custom chassis components are matched with typical M precision to the engine performance characteristics, ensuring a perfect blend of outstanding agility and precise handle. The BMW M235i Convertible amps up the passion and adrenaline of dynamic open-top driving to new heights. Like its BMW M235i Coupe stablemate, the open four-seater also has a distinctive and authentic character rooted in the experience of BMW M GmbH as a developer of high-performance sports cars for general everyday use. Drawing on this exclusive know-how, the BMW M235i Convertible provides the perfect balance of engine power, chassis engineering and aerodynamic characteristics to deliver levels of agility, precision and emotional intensity that are unsurpassed in the premium compact segment. Inline-six engine with M Performance TwinPower Turbo technology. The M Performance TwinPower Turbo inline-six in the M235i Convertible offers an infectious blend of responsive power, high revving ability and powerful torque that remains constant over a wide engine speed range. Highlights also include its highly efficient design, which gives the BMW M235i Convertible fuel economy figures that are all the more remarkable in the light of its performance. The M Performance TwinPower Turbo technology comprises a twin-scroll turbocharging system, High Precision Direct Injection featuring centrally positioned multi-hole injectors, VALVETRONIC variable valve lift regulation and Double-VANOS variable camshaft timing. A cooling system, engine management and engine sound tuning, all of which have been exclusively customized to the requirements of the BMW 2 Series M Performance models, complete the picture. Maximum power of 320 hp is generated between 5,800 and 6,000 rpm, from a displacement of 3.0 liters. The maximum torque of 330 lb-ft is available between 1,400 and 4,500 rpm. With the standard eight-speed Steptronic sport transmission with Launch Control function, the BMW M235i Convertible accelerates from 0-60 mph in 4.8 seconds. It is also available with a six-speed manual gearbox with dry sump lubrication. Its short-throw action provides extra-sporty shifting. 60 mph is reached from a standstill in five seconds flat. Top speed is electronically limited to 250 km/h (155 mph). In line with contemporary concerns, the BMW M Performance models incorporate an extensive range of BMW EfficientDynamics technologies. US EPA numbers are not yet available for the M235i Convertible, however the M235i Coupe boosts a near 20 percent improvement over its 135i Coupe predecessor. Agile and precise custom chassis technology. Thanks to typical precision-tuned M custom chassis technology, in the BMW M235i Convertible outstanding engine performance is translated into assured driving dynamics. Custom-configured suspension and damping systems as well as special front suspension elastokinematics are adapted both to the performance characteristics of the six-cylinder engine and to the specific requirements of the open body style. The M Sport brakes and variable sport steering – the latter again specially configured – are standard specification on the BMW M235i Convertible. Also standard are exclusive 18-inch M alloy wheels with mixed Michelin Pilot Super Sport non-run-flat performance tires in size 225/40 R18 front and 245/35 R18 rear. These specially developed high-grip tires optimally transmit all dynamic drive forces to the road. Optimized aerodynamic balance, sports car flavor in the cockpit. The precisely controllable handling of the BMW M235i Convertible is partly down to custom chassis technology but partly also to an optimized aerodynamic balance. Aerodynamically styled body parts, which include an M‑style front apron, are a hallmark of the BMW M235i Convertible’s design. The large air intakes in this apron, with flaps adapted from racing car design, extend into the area which on the other versions of the BMW 2 Series Convertible is reserved for the fog lamps. The exterior mirror caps are finished in Ferric Grey metallic. Further exterior design features include the striking side sill contouring and a rear apron whose lower section, in Shadowline metallic, also incorporates the twin tailpipes in black chrome. Further exclusive design features include door sill finishers with aluminum inserts bearing “M235i” lettering and a specially “tuned” interior that features sports seats for the driver and front passenger, an M leather steering wheel with multifunction buttons, Aluminum Hexagon interior trim with accent strips in matt Estoril Blue or high-gloss black, leather trim for the gearshift lever/selector lever and handbrake lever gaiter, and an M driver’s footrest. The custom instrument cluster features red markings and numbers for the speedometer and tachometer, while the instrument cluster with extended features additionally has a digitally produced model designation. Rounding off the interior specifications of the BMW M235i Convertible are variable-color interior lighting and blue detailing for the car key. Intelligent connectivity between driver, vehicle and outside world is another area in which the BMW 2 Series Convertible affirms its benchmark position in this class along with its advances over the previous model. The wide range of standard and optional driver assistance systems and mobility services from BMW ConnectedDrive – designed to optimize comfort, safety and the infotainment experience – is unique in the subcompact segment. On top of this, the 2 Series Convertible is the first BMW model to offer free-of-charge over-the-air updating of navigation data via the embedded SIM card, when equipped with the available BMW Navigation System. In another first for the BMW 2 Series Convertible, this standard SIM card is capable of supporting the LTE wireless standard, enabling fast and reliable data transfer. This system regularly updates its navigation data several times a year, whenever a new map version becomes available. There are no license fees or data transfer charges for the user during the first three years. The new home region map data is relayed to the vehicle wirelessly via the built-in SIM card, so there is no need for manual installation from external data storage devices. The update is installed conveniently and completely automatically, with progress being shown in the Control Display. Regular updating means there is never any delay before users are able to use the latest map software – and continue enjoying a perfect navigation experience. What’s more, all navigation features remain fully functional during the updating process. To support further improved data transfer for this and other BMW ConnectedDrive functions – such as the Navigation system’s Advanced Real Time Traffic Information (ARTTI) feature – the BMW 2 Series Convertible’s built-in SIM card supports the LTE wireless standard. The new high-speed internet technology provides much faster data transfer rates. Internet-based services can be integrated into the car via apps. The basis for this new dimension in intelligent connectivity is the optional Technology Package, which gives customers access to remote functions, BMW Online portal and Advanced Real-Time Traffic Information. The BMW Assist eCall with Enhanced Automatic Collision Notification function and BMW TeleServices, meanwhile, are standard specification on the BMW 2 Series Convertible. Many other functions can be added at any time using apps – either via a smartphone integrated with the vehicle using special interface technology or via the built-in SIM card. These include web radio functions and social media services such as Facebook and Twitter. This flexible apps strategy makes it possible to incorporate not just proprietary BMW Group apps but also BMW Apps-ready applications from other providers. This will allow BMW drivers to seamlessly transfer a host of functions they already use at home to their car. Enhanced convenience, safety and driving enjoyment with innovative driver assistance systems. The range of BMW ConnectedDrive driver assistance systems available for the BMW 2 Series Convertible offers unrivalled variety. Among its numerous features is a standard rain sensor with automatic headlight activation. If the optional Xenon headlights are specified, the vehicle is also equipped with Adaptive Headlights including cornering light, variable headlight distribution and adaptive headlight range control for city and highway driving. Customers can also order their car with the optional High Beam Assistant. Precise and convenient maneuvering is facilitated by Park Distance Control and the rear view camera (both included in the Driver Assistance Package), which displays its images on the iDrive operating system’s Control Display. The likewise optional Parking Assistant assists the driver in selecting and maneuvering into parallel parking spaces. BMW 2 Series Convertible can also be specified with the innovative Active Driving Assistant feature as part of the Driver Assistance Plus package, which also includes Speed Limit Info. This system includes the camera-based systems Lane Departure Warning and Forward Collision Warning as well as the Attention Assistant. Lane Departure Warning can be used at speeds over 37 mph and alerts drivers by means of a visual signal in the instrument cluster and a vibration of the steering wheel if they inadvertently drift out of their lane. At speeds upwards of 10 mph (approx. 15 km/h), Collision Warning detects if the vehicle is getting too close to traffic in front. In this case, as well as providing visual and audible warnings, the system also primes the brakes in order to minimize the braking distance the moment the driver intervenes. 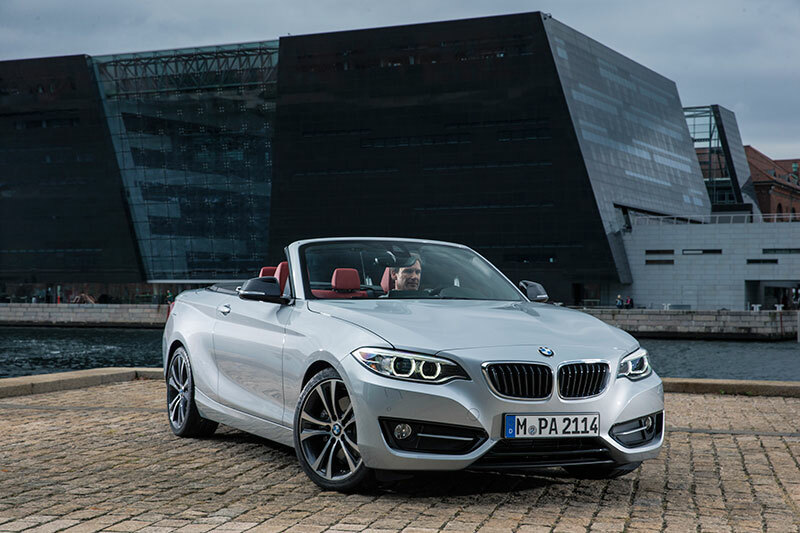 The all new 2015 BMW 2 Series Convertible will make its North American debut at the 2014 Los Angeles International Auto Show and arrive in US showrooms in early 2015.